Flu season has returned, and Dr. Mario is ready to fight the viruses with his Megavitamins. 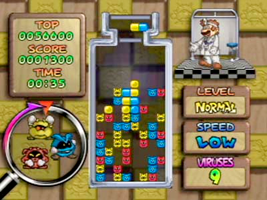 However, Wario is jealous and tries to steal the Megavitamins from Mario. A chase across the Mushroom Kingdom ensues, with many different characters challenging the heroes. Line up viruses with Megavitamins to create a line of four of the same colour to make them vanish. Clear the bottle of viruses to clear the stage.